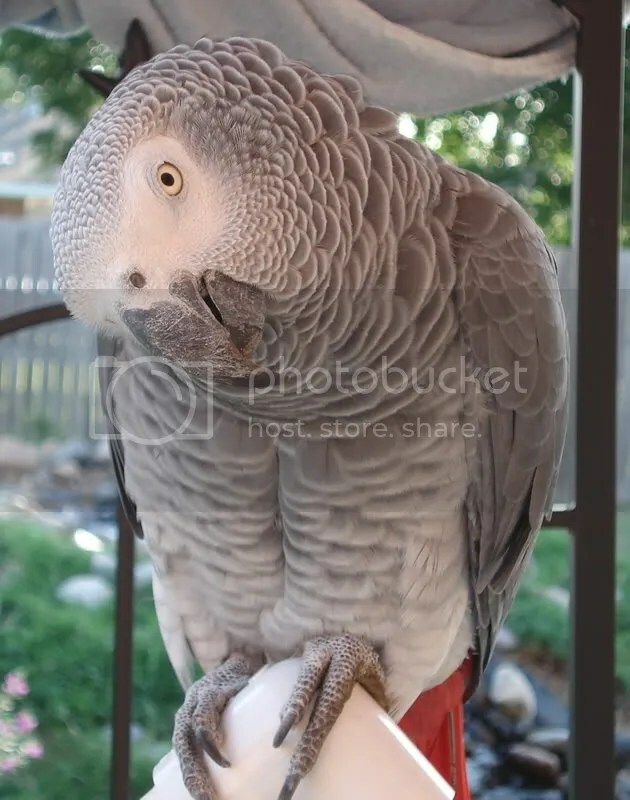 This morning, I heard that my African Grey Parrot, Rufus, learned a new animal sound. We were outside and he heard a ring necked dove cooing and then did the call himself. (dog yapping) Little, yappy dog. This must be “Merlin”. (squeeks, various) He loves to imitate squeeky doors and drawers. Hello birby! — He gets baby and bird mixed up and it comes out birby. Hello bird! — He will walk up to other birds and say this. La la la la la la la — Rufus like to make up his own songs. Rufus could already talk quite a bit before I adopted him. He’s really good at using words in context. His species is well known for being able to do that. He has learned quite a lot of additional words since he’s lived with me and my hubby, too. Rufus also has a great love for animal sounds. He likes for me to tell him what each is called so he can say them on cue. The only one that he can do consistently on cue is whine like a puppy. That is his favorite animal sound. But, he is learning all the time. He loves to learn new things. The list is not complete. I can’t remember everything he can say. I will be adding more as I hear them and as he learns new ones.